Game Facts: The Jim Calhoun Charity All-Star Game is a NBA format game with former players from Coach Calhoun’s 26 years as Head Coach participating. These are some of the great Connecticut players who have played regularly in this game in past years: Ray Allen, Emeka Okafor, Ben Gordon, Rip Hamilton, Caron Butler, Kevin Ollie, Donyell Marshall, Khalid El-Amin, Doron Sheffer, Ricky Moore, Rudy Gay, Travis Knight, Hilton Armstrong, Taliek Brown, Kevin Freeman, Charlie Villanueva and many more. 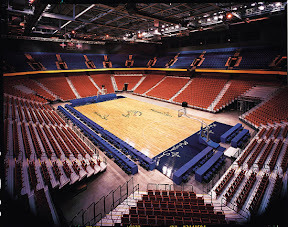 Arena Information: The Jim Calhoun Charity All-Star Game will be held at the Mohegan Sun Arena, Billboards 5th Top Venue In the World! 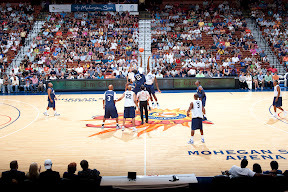 When it comes to live music and entertainment, top headlining concerts and premier sporting events, the 10,000-seat Mohegan Sun Arena, located in Connecticut, is the leader in the entertainment business. From Billy Joel, Fleetwood Mac, Britney Spears and Kenny Chesney in additon to Championship boxing, WWE and professional basketball - Mohegan Sun gets them all. Click on the seating chart below to enlarge and find where you can get your great seats! Stay tuned for more information about the upcoming 2018 Jim Calhoun All Star Game!